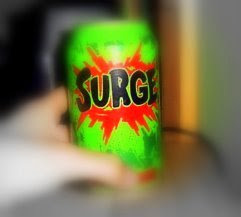 There are many rumors floating around the internet as to the origin of SURGE. This is a biography of the true story of SURGE - past, present and future. SURGE began life as a multi-million dollar project at Coca-Cola. The idea was to replace Coke's faltering Mello Yello brand and to compete with Pepsi's Mountain Dew. The criteria was to make a citrus soda that was high in energy and easy to drink. So in late 1994 the project began. During the next few months this new drink was formulated and reformulated until the taste testers had narrowed it down to just two formulas. One was a green-ish highly caffeinated drink that borrowed many ingredients and energy producing traits from Coke's PowerAID. The other lacked the sophisticated glucose polymers of PowerAID and simply relied on large amounts of caffeine. After many taste testing battles the green drink survived and the other was put into the Coke vault. But as we will see later it was given a new lease on life. As with all new products Coke needed to test their new product dubbed "URGE" (see right) and to be more secretive they decided to give the beverage a test run in Norway. URGE was rolled out in early 1996. It seemed Coke had hit the nail right on the head, they received much praise for the product and decided that the United States was ready for it within a year. Due to the fact that the research involved in making URGE was so expensive, Coke wanted to make a huge debut. So, they hired the TWD/Chiat Day advertising firm to start filming on commercials and to pick a suitable name for the US market. The name SURGE was given and the date chosen to show it to America was decided to be January 29, 1997 (Superbowl Sunday). During the game, 3 multi-million dollar spots which painted the picture of an "extreme" image were shown and Coke declared that SURGE would be available "soon". The rollout began in late February with prizes and SURGE vans. Promotional CDs were distributed to the tune of 3 million featuring songs by bands such a Jimmy Eat World and Luscious Jackson. At the beginning, SURGE was a hit. Coke couldn't keep it stocked on the shelves and it enjoyed a stellar first year selling 69 Million Cases. Yet even after the first year, Coke realized that there might be some trouble with the brand. At the same time Coke was looking for a milder citrus drink and they found it in the discarded second SURGE formula. This second formula was stripped of its caffeine and marketed under the name Citra. Citra was a relatively fair starter (21 million cases in its first year) but after a few years of growth it outsold even its older brother SURGE. Today, Citra has been discontinued in many parts of the USA but still lives on in a few markets. At the end of SURGE's second year (February 1999), Coke realized that the brand was really falling apart as sales fell 17.2 Million cases to 51.8 Million. Advertisement was re-doubled (or in the mind of this writer simply re-introduced) and a new logo was devised which somewhat coincided with a new look for SURGE's arch enemy Mtn. Dew. The new SURGE ads abandoned the running and screaming energy of the earlier spots and instead were decidedly more intellectual. Unfortunately this did little to spur sales of Coke's dying brand. By February 2000, just 3 short years after its huge introduction, SURGE lost another 48.5% dropping to 26.7 Million cases lagging behind Mello Yello and only .5 million cases away from being bested by Citra. Many bottlers across America began to re-evaluate whether or not to carry the brand. The next month a trend began. A trend that continues to this day. Bottlers began dumping SURGE for the revamped Mello Yello, the very beast SURGE was supposed to replace. By February 2002 most Coca-Cola bottlers stopped production of SURGE. Coca-Cola Enterprises (CCE), the largest bottler of Coca-Cola products in the world, dumped SURGE completely from their lineup dealing what many saw as the deathblow to the brand. Today, SURGE is no longer available in any prepackaged form and can only be found in soda fountain locations. So here we are now, with many skeptics thinking SURGE is dead. However, as long as their are people like us, independent bottlers, and even URGE in Norway - hope will not be lost. We have no crystal ball but we don't see SURGE disappearing from the picture completely. As we have seen with Mello Yello, Coke has no problem re-introducing products after many years. If Tab can survive, then so can SURGE. But we need your help. Please visit the How You Can Help section to become active in keeping or bringing back your favorite soft drink so that SURGE can once again bask in glory.